The world is a big place, and change to the very systems that God created to sustain life on the planet is happening all over this world. To be more precise, we are seeing accelerating decline in the earth’s systems – its oceanic, atmospheric, climate, food production and fresh water systems. The accelerating decline we see is the accumulated effect of millenia of sin (see this previous post for a full explanation) because sin separates creation from its Creator and the inevitable result of sin is death. Most of the changes we are seeing around the world are, to date, sporadic and moderate, though the impacts will certainly get much worse as outlined in prophecy. And, when it does get much worse, we will see panic and consternation as the full import of what is happening is perceived – again, as per scripture. Of all the changes that we see as the earth’s systems continue in accelerating decline, the changes to our weather is probably the most noticeable and easily tracked. It is important that we have seen a 300% increase in weather-related disasters since 1980. 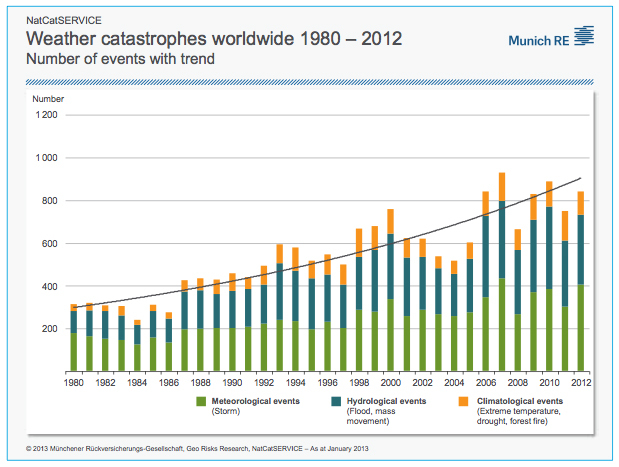 The graph below is from Munich Re, the largest reinsurance company in the world. Munich Re insures insurance companies, and so they have a significant financial interest in just about every weather-related disaster that happens on earth. This being the case, they carefully track such disasters and do as much research on them as they can in order to reduce their risk. One of the many places in the world where we are seeing very significant changes to weather patterns is in Brazil. The fact that we are seeing very significant – profound even – changes in Brazil is of global concern because Brazil is a massive producer and exporter of soybeans, corn and sugar – they help feed the world. Because food staples are largely fungible, any impact on Brazils crops will ripple through supply lines around the world, decreasing availability, increasing prices, and dramatically increasing the plight of the poor. And of course, when we see food price spikes we see a dramatic increase in societal tensions, resulting in conflict, hunger and disease – all of which fulfill prophecy (see this post for a fuller explanation). What has happened in Brazil is that they have had two record-smashing droughts in the past ten years. The second of these two droughts is ongoing and, in fact, the country did not fully recover from the first drought when it was hit with the second. The impact on Brazil has been huge. The price of food generally has increased and the price of a few staple items increased by 700%. But the impact has been much larger than food prices. What we are seeing is entire systems changing – Brazils long-term weather system for one, and the Amazon forest system for another. The first drought hit the Amazon rainforest hard and it had not recovered when the second drought hit. So what we really see are major systems in change, which in turn impact smaller systems such as rainforests and agriculture over much of the nation. As the earth iteself continues to destabilize, we will see more and more of this, and its impact on human society will become greater and greater. For now, much of the world is laughing off what is happening but Christians who are watching will be concerned both by the growing impact on the worlds poor and by the fulfillment of prophecy. Soon we will see greater and greater impacts on the earth itself. But even now we see massive systems changing at a terrific pace. One scientist who studies Brazil’s natural systems said, “We’re seeing the reliability of the seasons in the Amazon break down.” That is a big deal, and it is indicative of a global trend. Recently we saw flooding in Brazil. This is because, counterintuitively, rain in a drought falls on parched earth that cannot absorb it and so it runs off, causing flooding and significant topsoil loss. For a deeper exploration of both the flooding and the system change, take a look at this article. As I take pains to point out, what is happening is a global phenomena. And so of course we also see drought news out of the US, particularly out of California today, but also out of Oklahoma and Arkansas. Of course, all of this is reflective of the fact that, while the great drought of 2012 has gotten much better during 2013, it never actually ended for a great deal of the west and midwest, as we can see in this weeks Drought Monitor report below. 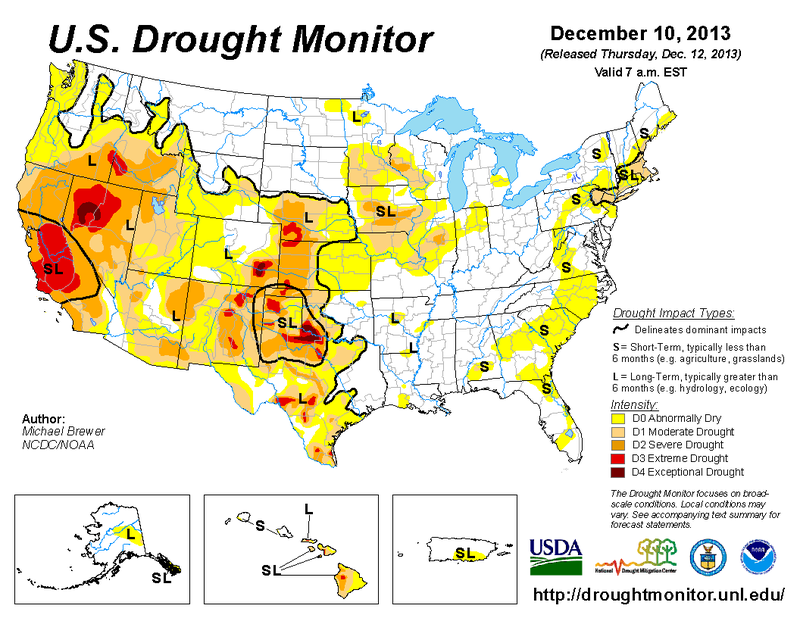 The drought in the US is current, real, and significant. Christians need to wake up to the fact that this earth and the society of man will simply not go on as they have, and that we should turn our back on the world and its lures and illusions, and dedicate our lives to being about our Father’s business. Here is a reference, for your interest, to an article today in The Daily Beast, “The End of the Arctic?…”, by Mark Heertsgard, on the disappearing Arctic icepack and its projected impacts on the rest of the planet, including weather patterns and seasons. Another voice trying to draw attention to the situation. Wow Rus – thanks! I look forward to reading it, probably tomorrow night. Have a blessed Sabbath!